NOMINATIONS FOR THE FUTURE AWARDS SEASON 8 CLOSES ON JUNE 18, 2013. 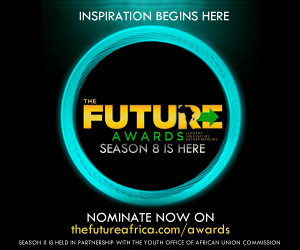 The Central Working Committee for The Future Awards, which is going Africa-wide this season, has announced that nominations for the 8th season comes to a close come Tuesday, June 18, 2013. "Nominations for The Future Awards Season 8 has been open for about a month and so far we have received thousands of entries from young and inspiring Nigerians with amazing innovations and works," said Chude Jideonwo, who is executive director of The Future Project. "Following our calendar, our board of highly experienced judges are going to undergo sessions of intense decision making to certify persons who will make it into the nominations list that will be published in June." The categories of The Future Awards Africa 2013 includes The Future Awards Prize in Advocacy & Activism, The Future Awards Prize in Science & Technology, The Future Awards Prize in Community Action, The Future Awards Prize in New Media. See full list HERE: http://www.thefutureafrica.com/awards/nominate . You can nominate on www.thefutureafrica.com/awards/nominate or via telephone on 08022226712. This edition is hosted in partnership with the youth office of the African Union Commission, based in Addis Ababa, Ethiopia, and nominations for the awards' biggest prize, Young Person of the Year to be Africa-based nomination. The event holds in August 2013. There will be no public voting for The Future Awards Africa 2013. Media Partners include Channels Television, Punch Newspapers, Silverbird TV, Nigeria Info, BellaNaija, LindaIkejiBlog, Jobberman, Premium Times, 360Nobs, LadunLiadiBlog and Information Nigeria. Official Media Partners are Africa Magic, Venture Africa, TW, Cool FM, Wazobia FM and Y!/YNaija.com. The Future Awards Africa, Inspiration begins here.